As a result of the number of questions that we at Select Sand & Gravel receive regarding the usage of Crushed Limestone Rock versus Crushed Concrete Rock, we felt it was important to state the differences in these types of Rock. There is an abundance of both materials in Dallas, Fort Worth, Austin, San Antonio, and Houston Texas markets that our company serves. We thought it would be useful to write an article to provide an overview as to the pros and cons of each type: Crushed Limestone Rock and Crushed Concrete Rock. 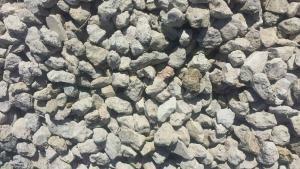 Both of these Aggregate Rock materials are used in the formulation of concrete as well as other applications. As such, a quick explanation of concrete would also be of assistance. Concrete was originally formulated by the ancient Romans. Generally speaking, it is poured into a mold when in the liquid form. Over the course of time it hardens into a formidable surface. Concrete is a mixture of cement, sand, and crushed rock or stone of different varieties. In the Texas area most of the crushed rock that is utilized is crushed limestone, crushed concrete, or a smooth river rock. The hardness of the stone is very important as there is a correlation between stone hardness and strength of the finished concrete. Crushed Concrete Rock can be interchanged to be used for some of the same applications with consideration of hardness and the appropriate engineering factors. For additional information regarding a Roadbase or Gravel Driveway Project, see another article on this site Titled, " Gravel Roadbase Driveway ". It is important to note that because the concrete material is recycled into Crushed Rock it may not be aesthetically pleasing. However, it can be used very effectively for the right project. Over time, many of the Crushed Limestone Rock Quarries have progressively moved away from the cities due to materials being exhausted and urban sprawl. The Crushed Concrete Rock however, is able to be produced in most cases right in the middle of town which can provide the material less expensively for construction or residential project uses. Select Sand & Gravel is a supplier of Crushed Limestone Rock and Crushed Concrete Rock for the construction or project uses stated above. Contact us at our offices if we can assist with further clarification regarding Crushed Limestone Rock or Crushed Concrete Rock and/or with any Sand or Gravel deliveries.